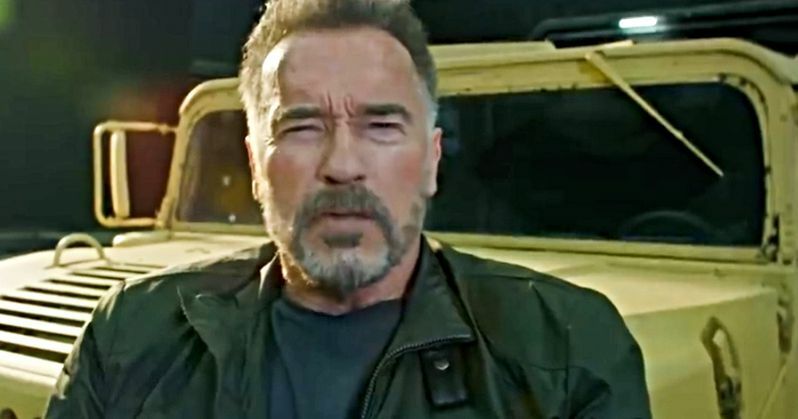 Arnold Schwarzenegger is back in a new Terminator 6 behind-the-scenes video. Fans have been waiting to see any official footage from the upcoming movie and this is it, though it doesn't contain any scenes from the highly anticipated sequel. James Cameron is back with the franchise as a producer this time around and it marks the first time that the director has worked with Schwarzenegger and Linda Hamilton, who is back as Sarah Connor, since 1991's Terminator 2. The sequel is still untitled as of this writing. The latest look at Terminator 6 comes to us from the Hungarian National Film Fund. The project started filming in Budapest, Hungary over the summer and has since taken production to the United States. Arnold Schwarzenegger and director Tim Miller are seen on the set praising the country along with the crews and the studios that they utilized. Schwarzenegger says that "Budapest is one of the nicest cities in the world," and goes on to state that deciding to work there was "the wisest decision" they ever made. Also featured in the Terminator 6 behind-the-scenes video is Hollywood producer Andy Vajna, who sadly passed away earlier this week at the age of 74. Vajna and Mario Kassar started Carolco, which produced huge movies including Terminator 2, Total Recall, Basic Instinct, and the first three Rambo movies. The latest video shows the producer's final overseas set visit. Arnold Schwarzenegger had this to say about Vajna's passing earlier this week. "Andy Vajna was a dear friend and a revolutionary force in Hollywood. He proved that you don't need studios to make huge movies like Terminator 2 or Total Recall. He had a huge heart, and he was one of the most generous guys around. I'll miss him. My thoughts are with his family." Terminator 6 will serve as a direct sequel to 1991's Terminator 2 and it will ditch all of the other movies that came after it. James Cameron has full confidence in Tim Miller taking on the new story and possibly setting up a new Terminator franchise that will introduce new characters. So far, we have only seen leaked footage and pictures from the set, along with some shots of Linda Hamilton and Arnold Schwarzenegger that the actor shared on social media. While the new Terminator 6 video doesn't offer up a whole lot, it is exciting to know that everything is running smoothly. The movie was originally going to hit theaters at the end of November, but it slipped into the previous Wonder Woman 1984 release date of November 1st, which means that we are now less than a year away from seeing the finished product. Hopefully we'll get some promotional footage in the next few months to get everybody hyped for the long awaited sequel. You can watch the Terminator 6 behind-the-scenes footage below, thanks to the Hungarian National Film Fund YouTube channel.